SUNY Canton Drops Pair to Maine-Presque Isle; Clarkson Ppd. April 13: The SUNY Potsdam softball team (5-17, 0-6 SUNYAC) lost both games against Buffalo State (13-11, 5-3 SUNYAC) 8-4 and 4-1, on a windy Saturday afternoon. 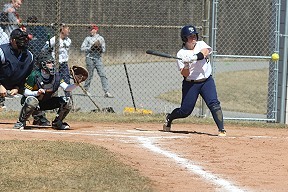 Senior captain Brooke Falsion (Brockport, N.Y./Brockport) went 6-for-7 with a run scored on the day. Junior centerfielder Lucy Condon (Kitchener, Ontario/St. David Catholic) went 1-for-3 with an RBI and a run scored. The Bengals started game one with two runs in the first. They capitalized on an error for the first run, and Taylor Benton doubled to left to score the second. Buffalo State added three more runs in the top of the second. With runners on the corners Alyssa Nichy hit a single to score one. One out later, Oriana Castello singled to left to bring in another run. Chelsea Davis plated the last runner with a fielder's choice. The Bears got on the board in the bottom half of the third. Potsdam got the bases loaded early in the inning with a pair of walks and a Bengal error. Condon hit the ball far enough in the infield to score one. Potsdam continued to battle back in the fourth. Junior second baseman Sarah Hyland (Stony Brook, N.Y./Ward Melville) started it with an one out single. Sophomore Sydney Miller (Hoosick Falls, N.Y./Hoosick Falls) scored Hyland with a deep double to left field, cutting the deficit to 5-2. In the fifth, the Bears brought in within one. Falsion started the inning with a single, and made it to second from a single from Condon. Sophomore catcher Shelby Van Epps (Ballston Lake, N.Y./Burnt Hills-Ballston Lake) scored Falsion with a single to center and moved Condon to third. Van Epps later stole second and gave Condon the opportunity to steal home and score. Buffalo State put the game out of reach in the seventh with a three-run home run, and won game one 8-4. Falsion went 3-for-3 with a run scored and Condon went for 1-for-3 with an RBI and run scored. Hyland and Miller both went 1-for-3. Senior captain Alissa McCauley (Malone, N.Y./Franklin Academy) (2-6) received the loss after pitching a complete game, allowing four earned runs and striking out three. In the top second of game two, the Bengals got on the board first with two runs. Hannah Dunlap scored one run with a single to right field. Nichy scored the next runner with her at-bat. Buffalo State got another run off a Castello single in the third to make it 3-0. They extended the lead to four with a sacrifice fly from Sydney McIntosh. Potsdam got several runners in scoring position in the fourth, fifth and sixth but could not convert it into anything. In the seventh, freshman left fielder Vanessa Brandt (Saugerties, N.Y./Saugerties) worked a one-out walk to start the late game rally. Falsion then singled through the left side and Condon followed up with a single up the middle to load the bases. The Bears were able to get one across home after a wild pitch but could not get anything else going and lost game two 4-1. Falsion went 3-for-4 in the game, while Van Epps and freshman first baseman Claire Donaldson (Lisbon, N.Y./Lisbon) both went 1-for-3. Brandt was the lone scorer for Potsdam. Junior Megan Fish (Getzville, N.Y./Williamsville North) (2-6) got the loss after pitching a complete game, allowing four runs and striking out three. In between games, Falsion and McCauley were honored by the Bears for their careers on Senior Day. 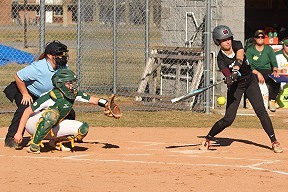 April 11: The SUNY Potsdam softball team (5-15) lost the twin bill against Clarkson University (16-10) on Thursday afternoon. The Golden Knights took game one 12-4 in five innings and took game two 8-2. 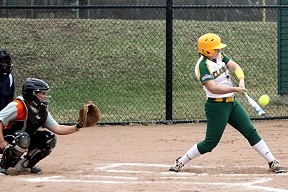 Senior captain Brooke Falsion (Brockport, N.Y./Brockport) went 3-for-5 with an RBI and a run scored on the day. Sophomore catcher Shelby Van Epps (Ballston Lake, N.Y./Burnt Hills-Ballston Lake) went 2-for-2 with an RBI and a run scored in game one. The Bears were the first to score. Van Epps started a two-out rally with a double to center. 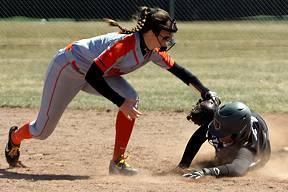 Junior first baseman Megan Fish (Getzville, N.Y./Williamsville North) followed up with another double, scoring Van Epps. Sophomore shortstop Grace Folmsbee (Red Hook, N.Y./Red Hook) got Fish across home with a single to right, giving Potsdam a 2-0 lead after the top half of the first. The Golden Knights gained the lead after scoring three in the second. With runners on the corners, Kyrstin Messier singled and scored one. Rylee LeBourvea then singled to center and scored two. Clarkson took advantage of a Potsdam error and put up two more runs in the bottom third, giving them a 5-2 lead. The Bears brought the game within one in the top of the fifth. Runners were on second and third when Van Epps hit a sacrifice fly to score one. Potsdam cut the deficit to one when Brooke Falsion stole third, then caused the catcher to make an error and scored. The Golden Knights took control in the bottom half of the fifth. Following a few hits and taking advantage of a couple errors, they put up seven runs and put the mercy rule into effect. Clarkson took game one 12-4 after five innings. Van Epps went 2-for-2 with an RBI and a run scored. Fish went 2-for-3 with an RBI and a run scored. Senior captain Alissa McCauley (Malone, N.Y./Franklin Academy) (2-5) received the loss after pitching four innings, allowing six earned runs and struck out two. Freshman Sierra Ashley (Lisbon, N.Y./Lisbon) pitched in the fifth inning and allowed two runs. Game two was a pitching duel as the game stayed scoreless heading into the fifth. Sophomore third baseman Sydney Miller (Hoosick Falls, N.Y./Hoosick Falls) started the fifth off with a single. Sophomore Jen Darlak (Lockport, N.Y./Wilson) pinch ran for Miller, and got to third following a couple of bunts. Falsion hit Darlak in with a double to left center. Junior centerfielder Lucy Condon (Kitchener, Ontario/St. David Catholic) brought in the second run for the Bears, giving them a 2-0 lead. The Golden Knights cut the lead in half in the bottom fifth, after a single to left field by Danielle Whitham. Clarkson had a seven-run sixth inning to put the game out of reach. The Golden Knights scored with a few singles and a pair of two-run home runs. Potsdam could not get anything going in the last inning and lost game two, 8-2. Falsion went 2-for-3 with an RBI and freshman left fielder Vanessa Brandt went 1-for-2 with a run scored. Sophomore Kiera Nesbitt (Sound Beach, N.Y./Miller Place) (1-3) received the loss after pitching 5.2 innings and allowing seven earned runs. McCauley came in to pitch for the final out. 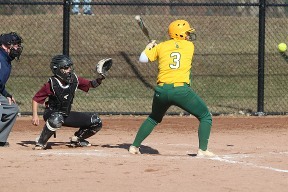 April 11: Big innings in the later portions of each game gave the Clarkson University Softball team a sweep of SUNY Potsdam on Thursday, as the Golden Knights won the opener 12-4 and claimed the nightcap 8-2 at Scott Field. The Golden Knights improved to 16-10 on the season and will be back in Liberty League action this weekend at Rensselaer and St. Lawrence. Potsdam dropped to 5-15 on the year. In game one, the Bears got on the board first with a pair of runs in their first at bat as Shelby Van Epps started the rally with a two-out double and then came home on a double by Megan Fish. Grace Folmsbee followed with a single to plate Fish, making the score 2-0 before Clarkson got its first hacks. The Knights were quiet in the bottom half of the inning, but scored three in the bottom of the second thanks to an RBI-single by Kyrstin Messier and a two-run single from Rylee LeBourveau. Two more runs came around in the bottom of the third on a bases loaded fielder's choice as a throwing error at the plate allowed two runs to come around. Potsdam kept things close with two runs in the top of the fifth, pulling back within one, 5-4. However, the Knights put up seven runs in the bottom half of the frame to end the game surprisingly early, considering how close it was up to that point. Raeanna Dunn doubled in two runs and later scored on an error. Liz Caggiano singled home a run, Michele Winn doubled one in and then scored on a wild pitch, and the game ended on a Hannah Bowen single up the middle for the seventh run of the inning, putting the Knights up 12-4. Caggiano was 3-for-4 in the game, while Dunn, Winn, Sarah Vaccaro, Bowen, Messier and LeBourveau each notched two hits. Vaccaro reached base in all four of her plate appearances, also drawing two walks. For Potsdam, Van Epps and Fish each recorded two hits. Game two was a different story as Olivia Zoeller and Kiera Nesbitt matched zeroes for the first four innings. Zoeller recorded at least two strikeouts in each of the first four innings before Potsdam touched her for two runs in the top of the fifth. Brooke Falsion doubled home a run for the first and Lucy Condon then pushed another run across on a fielder's choice. 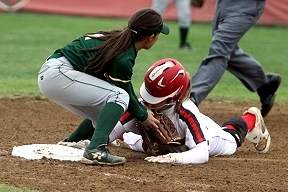 Clarkson responded with a run in the bottom of the fifth when Danielle Whitham singled home Kayla Robert. Down a run in the bottom of the sixth, Clarkson again posted a seven-spot to put the game away. Sarah Vaccaro opened the rally with a one-out single and was able to jog home on Kyrstin Messier's line drive, two-run homer to left, the first four-bagger of her collegiate career. Unsatisfied with a 3-2 lead, Clarkson continued to pour on the offense with Maddie Brink immediately following with a single. A fielder's choice put the Bears within one out of escaping the jam, but LeBourveau singled and Dunn drove in two with a hit up the middle. Danielle Whitham then delivered a single and stole second, allowing Dunn to take home. It wouldn't have mattered, however, as Liz Caggiano hit a two-run shot over the left-center fence, giving Clarkson an 8-2 advantage. Zoeller received a no-decision for her start, striking out eight and allowing five hits in five innings. Sam Mennig picked up the win in relief, giving up just one hit over the last two innings of the game as the Knights' offense woke up. Messier and Whitham each had two hits in the game, while Brooke Falsion struck for two hits for the Bears. 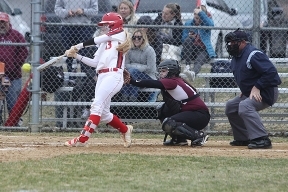 April 13: A pair of late-inning rallies helped Plattsburgh State to two one-run wins in a sweep of the St. Lawrence softball team in a nonconference doubleheader on Wednesday afternoon. The Cardinals won the first game 4-3 and the second 3-2 to improve to 13-9 overall, while the Saints drop to 8-11 after the sweep. Jordan Sheridan led the Saints with a pair of hits in game one, while first-year Mylea Mann had two RBI in game two. Both Emma Gailey and Allie Courtwright took losses on the mound, as Gailey allowed four runs on seven hits with a walk and three strikeouts in the opener, and Courtwright gave up three runs on five hits with three strikeouts of her own in the second game. The Saints had 2-0 lead in game one after one-run innings in both the first and the third, as Kylee Knight scored the first run of the day when Plattsburgh dropped a routine pop fly into short right field off the bat of Kelsey Murphy. Junior Carly Dziekan made it 2-0 when she scored on a RBI single up the middle by Courtwright. Plattsburgh chipped away in the top of the fourth with an RBI single of its own and then added three runs in the top of the sixth thanks to two hits and two errors to take a 4-2 lead. St. Lawrence got one back in the bottom of the frame on a sacrifice fly by first-year Abrianna Schlickenmayer that plated Elle Gray, but couldn't find the equalizer as they stranded one in the bottom of the seventh to end the game. The Saints got opened up a 2-0 lead in game two as well, with a two RBI double to right center by Mann in the third that scored both Sheridan and Kelsey Murphy. Plattsburgh cut the home team's lead in half with a run in the top of the fifth off a muffed throw by the Saints first baseman, but the Saints were able to get two quick outs and strand a pair of Cardinals to prevent any further damage. But the visitor's led off the seventh with a triple to the base of the wall in right field and tied the game on a sac fly to center the next at bat. After a single and a fielder's choice, the Cardinals took the lead for good with an RBI single through the right side for the eventual 3-2 margin. St. Lawrence will travel to Clarkson for a Liberty League doubleheader on Thursday, before hosting RPI and Union for a pair of conference doubleheaders this Saturday and Sunday. April 10: St. Lawrence and Skidmore traded one-run victories in a Liberty League doubleheader on Sunday afternoon in Saratoga Springs, with the Saints scoring four runs in the final two innings of the second game to come from behind for an 8-7 win and secure the split. Skidmore won the opening game 2-1 with a walk-off run in the bottom of the seventh. With the split, St. Lawrence is now 8-9 overall and 1-1 in conference this season, while Skidmore is 9-13 and is also 1-1 in Liberty League play. In game one, Skidmore took a 1-0 lead in the bottom of the first inning on a solo home run to left center, but the Saints pulled even in the top of the second when first-year Elle Gray hit an RBI double to left center that plated sophomore Emma Reakes for the Saints lone run of the game. With two out and one runner on the in the bottom of the seventh inning for Skidmore, Saints pitcher Emma Gailey walked Karly Fishkin and then intentionally walked Dani DeGregory to load the bases. An error on a ball hit to the infield by the next batter, May-Lin McEvoy, allowed the second and winning run to score for the Thoroughbreds. The Saints outhit Skidmore in the first game seven to four, but stranded seven runners in the game. Elle Gray led the Scarlet and Brown with a 3-for-3 performance, while Kylee Knight also had a multi-hit day, going 2-for-3. On the mound, Gailey pitched six and two-thirds, allowing just four hits and one earned run, while striking out five. With the loss, the Simsbury, Conn. native is now 4-2 on the year. Gailey was also the pitcher of record in the Saints win in game two, picking up the win in a relief appearance as St. Lawrence used its full staff on Sunday afternoon. Allie Courtwright started and pitched one and two-thirds innings allowing five hits and three runs with two strikeouts before she was relieved by Hannah Sears who pitched two and a third with three hits, three runs and two strikeouts before. Gailey worked three innings to finish the game (4H, 1R, 2SO). The Saints jumped out to a 4-0 lead in the top of the second inning on five hits and one error, with runs coming across on a two-RBI single up the middle by Gray and then an RBI sacrifice and single by Kylee Knight and Madison Yarborough, respectively. Skidmore responded with three runs on four hits in the bottom of the frame and took a 6-4 lead with three more runs in the bottom of the fifth. In the top of the sixth, Knight tied the game for the Saints with a two-out, two-RBI double that plated both Elle Gray and Jordan Sheridan before she was thrown out trying to advance to third. Skidmore added another run in the bottom of the sixth to regain the lead at 7-6, but an RBI double by Courtwright and an RBI single by Carly Dziekan in the top of the seventh gave the Saints their eventual 8-7 edge and the win. Of the team's 10 hits in game two, Mann, Courtwright and Gray each had two apiece, while Knight led the Saints with three RBI in the contest. April 13: The softball bats posted 31 runs on 31 hits in a pair of 11-1 and 20-1 run-rule victories v. NVU-Lyndon in a North Atlantic Conference (NAC) doubleheader on Saturday. The Roos improve to 10-14 overall and 3-3 in conference play, while the Hornets fall to 0-14 and 0-4. The Roos jumped out to a quick lead scoring all 11 of their runs in the first inning of the opener. NVU-Lyndon scored their lone run in the fifth and final inning. Jordan Knapp was a perfect 3-for-3 from the plate driving in a pair of runs. Valerie Clark, Sophia Harris and Jaedyn Ossont all had two hits each and scored twice, while Ossont drove in two runs. Alicia Evans and Mackenzie Currie also recorded two hits apiece. Clark, Harris, Evans and Kayla Chavarri finished with one RBI each. Chavarri earned the win on the mound tossing four innings of one hit ball as she didn't allow a run and struck out four batters. Madison Austin pitched the final inning in relief giving up one run on two hits with a strike out. Amber Roberts took the loss giving up 11 runs with two strike outs and two walks. The SUNY Canton bats once again wasted no time jumping all over the Hornet pitchers posting 11 runs in the first inning, two each in the second and fourth innings and five in the third. Clark, Currie and Selena Tasli were all perfect from the plate as they each went 3-for-3 combining for nine runs and 9 RBI. Clark and Ossont both hit home runs as well as recording a double apiece. Ossont and Wildeline Peralta each had a pair of hits, while Felicity Machado had a 2 RBI double in her lone at-bat in the third. Alaina Beane earned the win on the mound tossing a complete game one hitter. She gave up one unearned run with five strike outs in five innings. The Roos hosted Fostering Futures of St. Lawrence County, an affiliate of the Children's Home of Jefferson County (CHJC) Foster Care Program, at their doubleheader where a pair of children threw out a ceremonial first pitch. The Roos also sold raffle tickets and gathered pajama donations. Each year Fostering Futures of St. Lawrence Country gives each foster child in the care of their homes a book and a pair of pajamas for Christmas Eve. April 12: Kayla Chavarri drove in both SUNY Canton runs and earned the win on the mound in the opener as the softball team split a non-conference doubleheader v. SUNY Delhi on Friday afternoon. The Roos defeated the Broncos 2-1 in the opener, before falling 7-2 in the nightcap. Chavarri opened the scoring for the Roos in the first inning when she plated Jaedyn Ossont on a sacrifice squeeze. Ossont led off the inning with a double down the left field line and moved over to third on a sacrifice from Sophia Harris. The Broncos tied the game in the third when Shelby Nolan scored Jaylynn Shepard on a sacrifice fly to right. The Roos took the lead for good in the fifth. After Ossont and Harris drew walks Chavarri came through with a one out RBI down the left field line. Delhi went down in order in the sixth and but got a leadoff double from Shepard in the seventh. After a flyout the game ended on a double play as Natasha Pico flew out to right field and Brittany Miner made a great throw gunning down the runner at third to end the game. Chavarri earned the win striking out seven batters and giving up five hits and one run in the complete game. Molly Greene held the Roos to four hits in the nightcap to earn the complete game win. Alaina Beane surrendered eight hits and four walks while striking out three batters. Chavarri and Alicia Evans recorded doubles, while McKenzie Mattison and Mackenzie Currie had base hits for Canton. Delhi struck for three runs in the second inning and two each in the third and sixth frames en route to the victory. Haylee Lefebvre led the Broncos with three hits, while Yesileidy Paulino also posted a pair of hits. 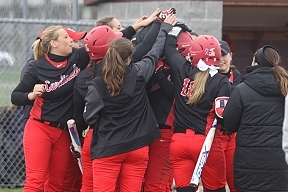 April 13: It was a North Country tangle on Wednesday afternoon when the Plattsburgh State softball team squared off with the St. Lawrence Saints in non-conference action. The Cardinals pulled off two late game turn-arounds to down the Saints 4-3 and 3-2 in both contests. Game 1: Plattsburgh 4, St. Lawrence 3 A sixth inning surge propelled the Cardinals to victory in the first matchup with the Saints. Trailing 2-1, Plattsburgh State pushed across three runs in the top of the frame to take a 4-2 lead. 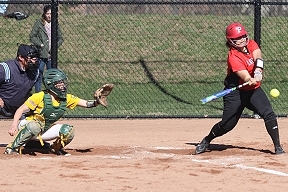 Both Dominique Zummo and Amy Glashoff reached on errors for Plattsburgh. Playing as the designated hitter, Hope VanBrocklin doubled to left field to bring in a run. Immediately following VanBrocklin, freshman Anna Fisher singled up the middle, scoring Glashoff and VanBrocklin for the Cardinals. The Saints tried to counter in the bottom of the frame, when Abrianna Schlickenmayer flied out to center field, scoring Elle Gray. However that was the only run the Saints would score for the rest of the game. Cardinal senior Morgan Anderson went five and one third innings, striking out three and allowing one earned runs. Offensively Fisher led the Cardinals from the batter's box, going 2-3 with two RBI's. Game 2: Plattsburgh 3, St. Lawrence 2 Facing a 2-1 deficit in the top of the seventh inning, Plattsburgh State Head Coach Stephanie Conroy made the decision to insert Fisher, coming off a solid game one performance, as a pinch hitter to lead off for the Cardinals. Well that decision proved to be huge as Fisher smacked a triple to right field to get the Cardinals rallying. Nicole Cast then flied out to center field, scoring Fisher and knotting the game at 2-2. Plattsburgh wasn't quiet done yet. After Kelsey Gage reached on a fielder's choice, the Pine Bush N.Y. native stole second, giving teammate Kaitlyn Preiss a chance to give the Cardinals the lead. Preiss did just that when she singled through the right side off of Saints pitcher Allie Courtwright, which scored Gage from second base. The Cardinals had to turn around and play defense in the bottom of the seventh behind sophomore pitcher Katie Pitkin, who went all seven innings. Pitkin was dominant in her matchup with St. Lawrence, only allowing three hits, giving up one earned run and striking out six batters. With the two wins the Cardinals sit four games above .500 at 13-9, while the Saints fall to 8-11 overall. Plattsburgh will be back in action on Friday as it hosts the Brockport Golden Eagles at Cardinal Park at 3 p.m.
April 10: It's not often there is a Sunday showcase for the Plattsburgh State softball team, but that was case in the matchup with the Oneonta Red Dragons as the Cardinals swept the doubleheader games 6-3 and 12-4 (6 inn.) on a chilly Sunday afternoon. Game 1: Plattsburgh 6, Oneonta 3 Oneonta struck early in game one of the doubleheader. Getting two runs through on Cardinals pitcher Morgan Anderson. However it was the Cardinals who would strike next in the third inning on a two out rally. With a man on, Jennifer Groat doubled to bring in Anna Fisher. Following Groat, Amanda Tantillo then tripled down the right field line to tie the game at two. It was Plattsburgh again in the fourth inning showing its offense prowess, Jackie Decker and Kaitlyn Preiss each singled to left field to bring in a run, while Groat recorded a sac fly for the third run of the inning. It was Groat again in the sixth with a base knock that brought in Fisher to round out the Cardinal scoring. The Ballston Spa native went 2-3 with three RBI's in game one. Meanwhile, having given up two early runs, Anderson found a groove on the mound, keeping the Red Dragons off the board until a one run seventh. The only Cardinal senior went all seven innings and struck out three batters in earning the win. Game 2: Plattsburgh 12, Oneonta 4 (6 inn.) Plattsburgh was warmed up for round two with Oneonta. Offensively the Cardinals came out of the gates swinging, scoring five runs in the first two innings compared the Oneonta's one. A quiet third and then three runs in the fourth and four runs in the sixth would cause an eight run rule to take effect and end the game in the bottom of the sixth innings. Cardinal freshman Amy Glashoff was on third when Red Dragon pitcher Amanda Graziano let one loose and allowed Glashoff to score to end the game. Cardinal sophomore Katie Pitkin went five innings on the mound, fanning three batters and walking two. Freshman Samantha Railey came in for relief in the sixth. Offensively, Groat was 4-4 in game two with two RBI's, Tantillo went 2-2 from the plate with two RBI's and Decker 3-3 with four runs batted in. With the win the Cardinals now sit at 11-9 overall, and move to 2-1 in SUNYAC play. Oneonta falls to 8-10, while dropping its first set of conference games now has them at 0-2 in the SUNYAC. Union at St. Lawrence University, ppd. SUNY Brockport at SUNY Potsdam (2), ppd. SUNY Canton at Wells (2), ppd.